Phew! We had a busy week with a few extracurricular activities. Enjoy! 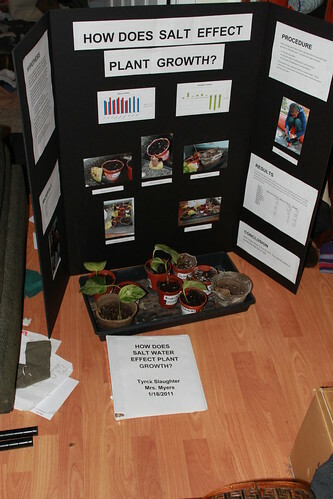 On Tuesday night, Tyrek came over and finished up his report and backboard for the J.C. Sawyer Science Fair. On Thursday, the Pasquotank/Camden Relay for Life had their Team Captain’s Meeting. Khalif and Terrance came with me. 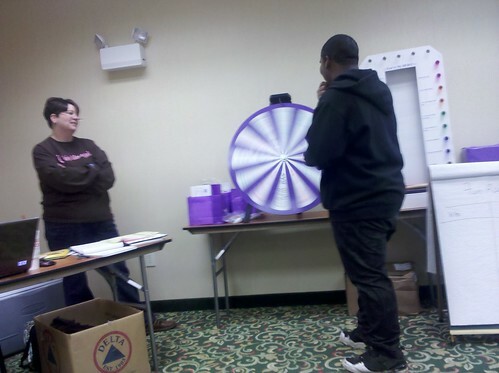 Khalif even got to spin the prize wheel and won a hat. 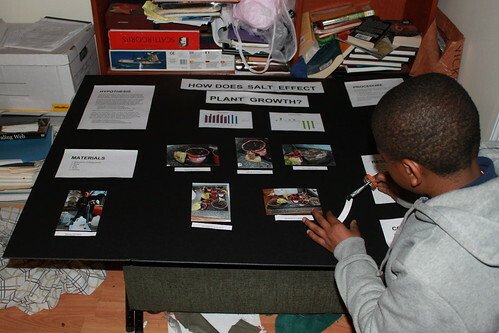 Both boys were very helpful. Khalif got some people registered online, Terrance took some pictures for the recap and both helped the committee members pack up their cars. Since the meeting, Khalif and his grandmother have already raised $35 more dollars for Relay. Go Hunter Street Hope! The Year of Living Unofficially tipped us off that January 23rd was National Blonde Brownie Day. 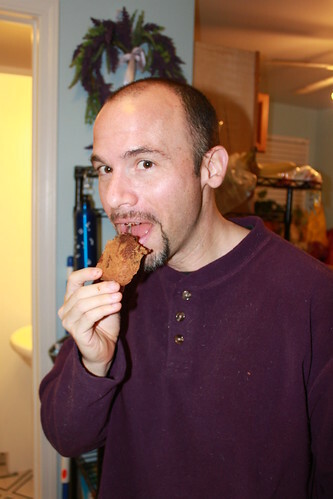 Early in the day, Ryan and I perused and picked out a Blonde Brownie recipe. That afternoon we made ourselves a special treat to enjoy after our supper of turkey chili. The brownies turned out to be quite serendiptious. At 3 AM, I had to get up for a support call. This exceedingly unappealing activity had a surprising silver lining. I may have had to get out of bed. 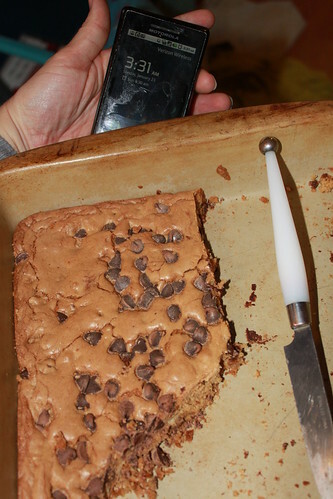 BUT— I had leftover brownies to assist me! Ryan and I have friends, Brittany and Chris, who are going to celebrate a holiday every day in 2011. They’ve researched and found quirky, off-the-beaten-path holidays, stuff like “National Drinking Straw Day” and “National Bubble Bath Day”. Their blog, “The Year of Living Unofficially“, shows the upcoming holidays and each evening they recap the day’s celebration. 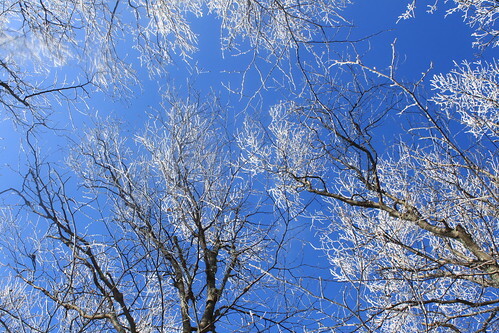 Although we are only 12 days into 2011, I’m pretty confident they are going to stick to it. Last week the wife contracted the stomach flu, but they still managed to observe “National Bird Day”! We watched the recently restored version of Fritz Lang’s 1927 silent film masterpiece “Metropolis“. I took a few moments to sit outside and enjoy the birds in our yard. I also reflected on all the opreys Ryan and I saw kayaking this year. YES! Fleece pants, toe socks, a warm comforter (the dragon blanket) and Star Trek Voyager episodes on DVD made this unofficial especially relaxing. Ryan was manning Earth 383 for Friday Night Magic. I picked up Toyama’s and we feasted on tempura while watching the shop! Anyway, we’ve been having fun reading about all Brittany and Chris’s adventures and discovering holidays we never knew existed. I definitely recommend the site! You can also follow them on Twitter and Facebook! A few years ago, my boss Larry and I were on a business trip in Pennsylvania with some extra time. We decided to stop by Valley Forge on our way to the airport. As we made our way to the National Park, Larry and I rambled on as we tend to do and we both talked about all the things we remembered about Valley Forge. When we arrived, we were dumbfounded at how consistently inaccurate our recollections were. For example, the men did not in fact leave Valley Forge to sail across the Delaware River to win the war. 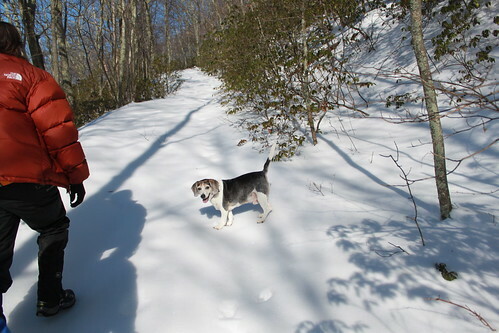 The most treacherous part for the humans on our snowy Kelly’s Knob hike was our drive back down icy VA-601. For Henry, it was the snow itself. All seemed well at first. Henry was having a good ole time and was as happy as I was to be reunited with the Appalachian Trail. Then suddenly, history in action. We started to notice blood in the snow. The footprints got bloodier and bloodier. We didn’t have a Martha Washington on hand to knit some socks for Henry. But we did have a Ryan Somma. Henry soldiered on for as long as he could. Finally, he acquiesced and let Ryan carry him the rest of the way. In a few days, Henry’s paws were as good as new. At least, that’s how I recall it now. 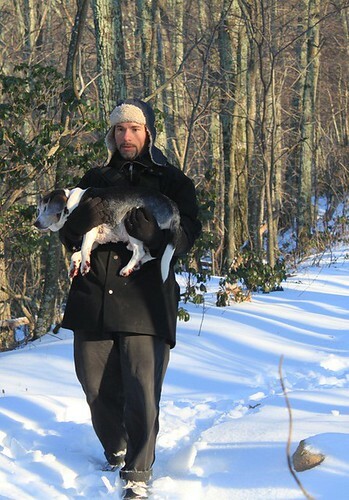 On Sunday, December 19th, we got to hit the Appalachian Trail with the dogs and our friends Tony and Meredith. 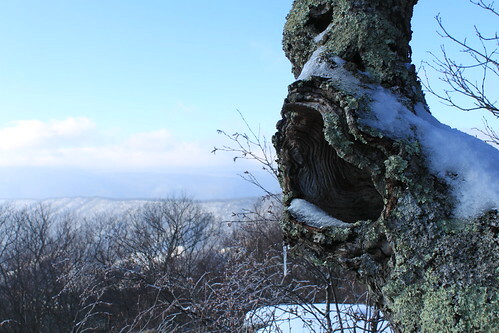 We went from the Rocky Gap/VA-601 trailhead up to Kelly’s Knob. It’s about a 3.8 mile round trip. It starts off steep with a roughly 500-600 foot ascent in the first half mile (Source: Elevation Map from weaselworks). 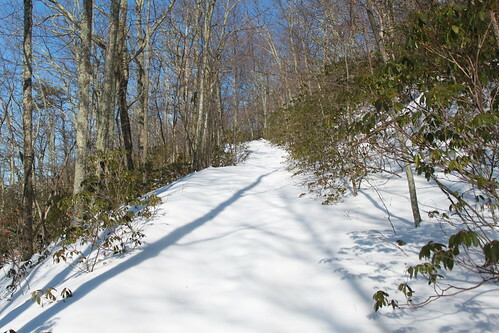 Don’t let the beginning fool you though, once you make it up to the intersection of the John’s Creek Mountain Trail, it is all ridgeline and smooth sailing. 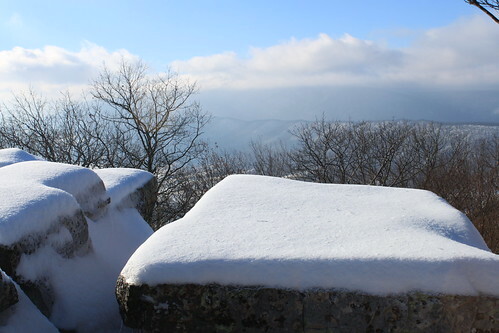 I’ve done Kelly’s Knob a number of times (see my other Kelly’s Knob posts), but this time was by far the snowiest. 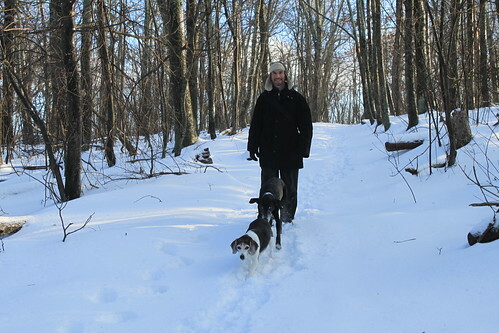 When we started our hike, there was a lone set of footprints already in the snow. Apparently that hiker was fooled by the steep beginning because surprisingly soon the footprints disappeared. That left us with fresh snow to hike in. The top was as gorgeous as usual. As I have written before, you can see the Virginia Tech campus from Kelly’s Knob. That particular day, we didn’t take advantage of it. 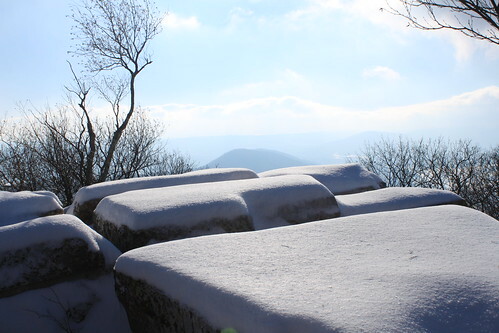 None of us were courageous/foolish enough to climb out onto the snow-covered rocks. Luckily, what we could see from the security of the trail was quite striking. 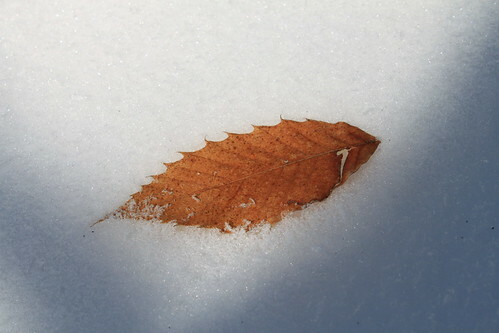 I didn’t see any American chestnut trees as we hiked (there are a whole bunch of them south of Rocky Gap) but I did spy an American Chestnut leaf in the snow! The most trecherous part of our journey (for the humans) was actually driving home. With intentions I’m certain were good, someone had attempted to plow the gravel VA-601. Unfortunately the efforts had produced a formidable sheet of ice. We had 1.5 miles back down to paved and cleared road. 1.5 miles of a steep icy road with particularly unnerving dropoffs in lieu of shoulders. Ryan, Meredith and I all agreed Tony would be the most qualified to get us off the mountain. He did not let us down! In 4WD low and in first gear, with occassional brake pumping and steering the vehicle onto exposed gravel or loose snow, he slowly but surely got us down. My heater in my car was broken which proved to be advantageous to our trusted driver. Thanks to Tony’s patient driving, we all got to go home with untainted memories of another great adventure. 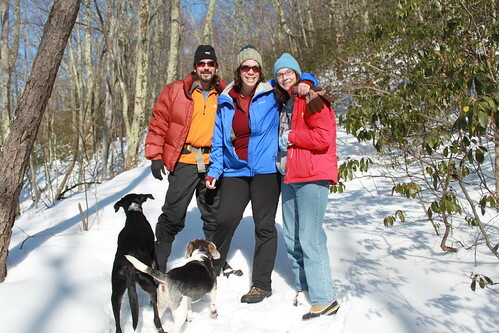 More pictures of our hike to Kelly’s Knob can be found on my Flickr site. 4WD Requirements: The last 1.5 miles of VA-601 is a gravel hill, but it is well maintained and I have seen non-4WD vehicles make it up in non-icy conditions. Trailhead Parking: The VA-601 trailhead has a small parking area to the left. On busy days, cars park on the side of the gravel road. Take 460 West and turn right on VA-42. When VA-601 turns to gravel, you have about 1.5 miles to the top. Once there, AT Southbound is to your left and AT Northbound is on your right. Along the way, you’ll pass by Sinking Creek Bridge, a covered bridge built in 1916.